You’ve done your research and you’ve decided that dental implants are the best solution for replacing your missing teeth. Congratulations! You’ve made a great choice because dental implants are healthy, convenient, and they can last a lifetime if properly cared for. Now that you have settled on dental implants as the best solution for restoring your smile, we can get the process started. First, you will meet with Dr. Grubb who will review your dental history and your overall dental health with you. Once you and Dr. Grubb have decided that dental implants are the best option for you, we will meet with you to determine a timetable that fits your schedule. Next, someone from our outstanding team of dental health professionals will sit down with you and help you prepare for dental implants. You will preview the entire process in detail and you will also receive written instructions about what you can do to prepare for each step of the procedure. The important thing is that you feel confident and ready for your new smile. Please feel free to contact our office at any time if you have questions or concerns. 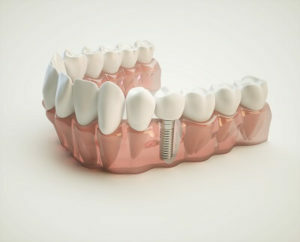 The entire dental implant process usually takes about 3 to 6 months to complete. However, it may take longer if Dr. Grubb concludes that you require any preliminary treatments to prepare the site for dental implant surgery. The most common preparatory procedures are bone grafting to augment the jawbone and treatment for gum disease. Here’s a list of all the steps involved in the dental implant process. It’s important to remember that not everyone will require any pre-implant procedures. You will receive detailed instructions on what to expect at each stage of the implant process; however, sometimes it’s nice to have someone knowledgeable to talk to. Please don’t hesitate to contact Dr. Grubb’s office at any point in the dental implant procedure if you’re feeling any type of apprehension. That’s what we’re here for. Understanding what to expect will help you feel confident and secure about the dental implant process. And it’s important to remember that some pain, swelling, and bleeding are common parts of the recovery process. Patients typically encounter a bit of swelling after the fixture that will hold the implant in place is fitted. The swelling usually reaches its highest point 2 to 3 days after surgery. However, your level of pain should peak about 6 hours after surgery. You can use medication and an ice pack on the cheekbone to counteract any pain or discomfort you are feeling. Remember to only take medications that are prescribed by your dentist and strictly follow the directions that come with your medication. Bleeding is another common side effect of dental implant surgery. Blood may continue to leak from the surgical site for up to two days following the surgery. Feel free to change your gauze as necessary. Dry lips and bruising of the cheek are two more common side effects of dental implant surgery. You can use Vaseline or another lubricant to treat dry lips. The bruising should subside after two to three days. As always, please contact us at Dr. Grubb’s office right away if you have any questions about your recovery. Once your smile has been fully restored with our dental implants, you will be ready to relax and enjoy the new you. No more worrying about your smile and no more worrying about what you can and cannot eat. Have fun!